A variety of urns with fresh flowers. 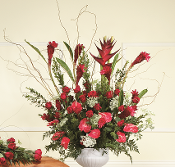 All funeral flower arrangements are made at our local flower shop in Los Angeles by a dedicated funeral florist. Giving each flower arrangement the care, respect and love.